Voting was never as easy as it has been during Indian General Elections 2014. Technology has been introduced at every stage to enable voters to exercise their voting right with ease. Telephone (mainly SMS) and internet based solutions are being widely used this time. Internet giants like Google have also contributed in their own way. Eg. Google India's Know your Candidate initiative. One of the problems faced by several voters is locating their polling station. This is much difficult in big cities as the location would be some government school and citizens often have little idea about the whereabouts. These schools are also a place for citizens to enroll for voting rights. However, with the ability to enroll online, one needs to visit the place only to vote! Hence Election Commission's move to enable citizens locate their polling station online, that too through maps is a welcome move. 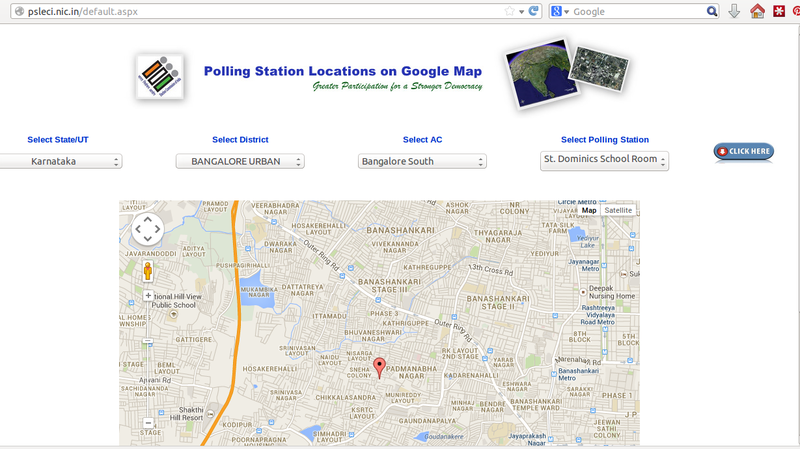 The main EC website and several other state websites have a Google Maps based solution to locate polling station. This is very simple to use and with few clicks a citizen will be shown the location of the polling station. Clicking on the location icon and then hyperlink for more information will take you to another page which has some basic information about important personnel. 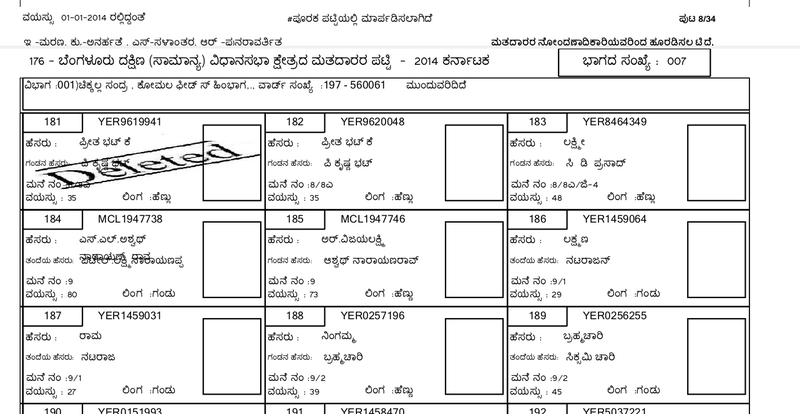 A link there can be used to download the entire electoral roll in PDF! Chief Electoral Officer, Andhra Pradesh Office went for a better offering to empower voters. This better solution is ArcGIS Online. While I'm not impressed with the look and feel of the website - mainly because Esri's offerings were not used as is and only the map was embedded in their custom portal. Nevertheless, the site has made search of polling station easier and provides a host of information to the visitor on polling stations including photos of the building and booth level officer. 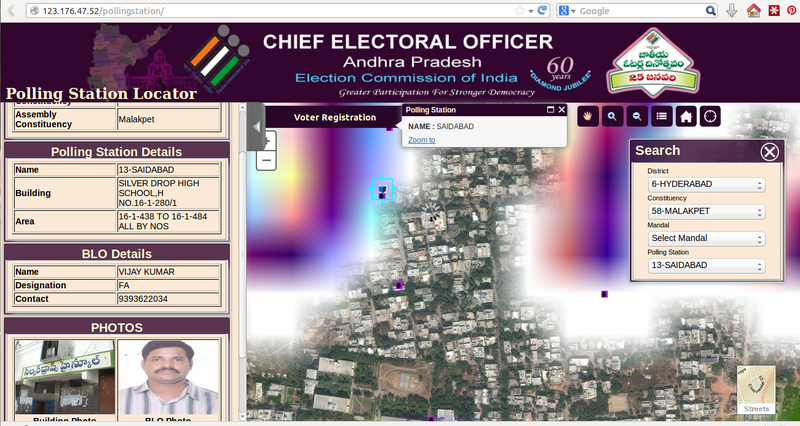 Download links (both English and Telugu) to download Electoral Rolls were available. A user could not ask for more with this! The site's loading time was slower (maybe due to underpowered server infrastructure) but I am truly impressed with the efforts that went in for setting up the portal. A mobile app is also on offer for AP voters! Android and iOS. These apps also allow users to find the route to polling station. Looks like no one remembered ISRO's Bhuvan for setting up GIS based polling station finder. Bhuvan's mainstream adoption has not happened yet and Google Maps is still the de-facto standard. Election commission should have publicized these initiatives more. Most of the times they broadcasted information on how to locate polling station by sending an SMS.